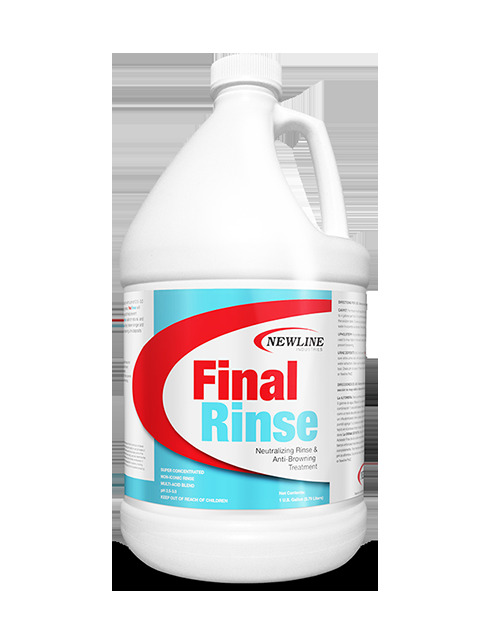 Final Rinse is a specially formulated mild acid solution used as the final step in the wet cleaning process. Final Rinse is safe on natural and synthetic fibers and will remove soil and shampoo residues, stabilize dyes and help prevent browning in carpet, rugs and upholstery. When Final Rinse is used, carpets will stay cleaner longer and have a softer feel. It is also effective in dissolving urine deposits when used as directed. Portable carpet cleaning: Dilute 1 oz. per gallon. Truck mounted carpet cleaning: Dilute 16 oz. per 5 gallons. Meter at 2 - 4 GPH. Portable upholstery cleaning: Dilute 1 - 2 oz. per gallon. Use as a rinse during cleaning or as an anti-browning post spray. Carpet post spray pH stabilization: Dilute 1 - 4 oz. per gallon. Do not over wet carpet. Carpet urine deposit removal: Dilute 3 - 6 oz. per gallon. Saturate entire stain. Allow 10 - 20 minutes of dwell time. Extract thoroughly. Check carpet pH. If carpet pH is over 5, deodorize with a mildly alkaline enzyme.